Crushed Tomatoes, Sugar, Vinegar, Mustard, Cayenne Peppers, Spices, Habanero Peppers, Brown Sugar, Salt, Molasses, Xantham Gum, Natural Smoke Flavor, Onion, Garlic, Green Bell Peppers, Lemon Oil, Spice Extractives. 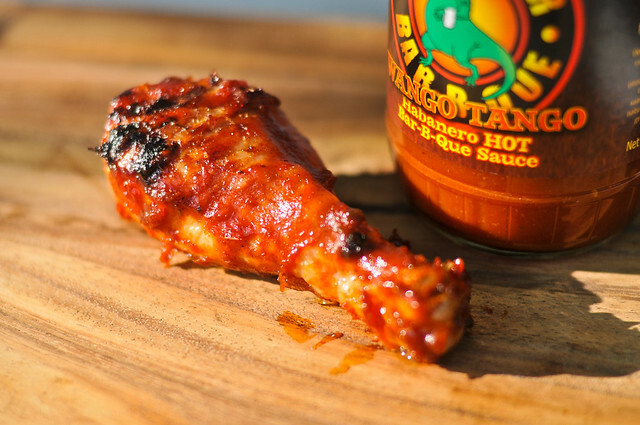 This sauce builds on the skillfully balanced and fresh qualities of Dinosaur Bar-B-Que's Sensuous Slathering Sauce, but adds an intense dose of fruity heat from habaneros that will most likely excite heat seekers, but also masks some of excellent flavors that made the original so good. 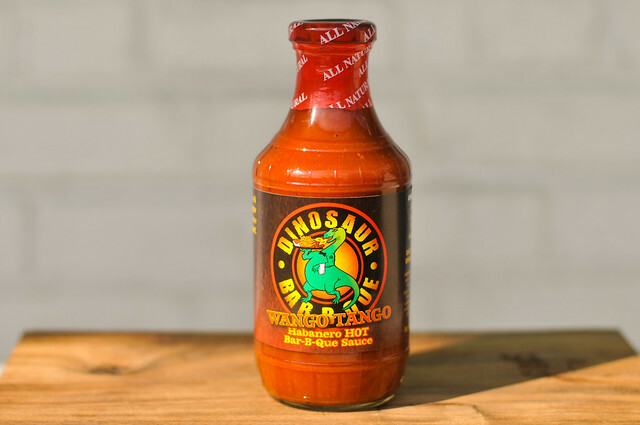 Writing this between day one and two of the Big Apple BBQ Block Party, seeing John Stage chopping an seemingly endless amount of pork shoulders at Dinosaur Bar-B-Que reminded me of their spicy Wango Tango sauce I tested but had yet to post. This New York barbecue outfit has four stores, originating in Syracuse, and four barbecue sauces available for sale online. Check out the review of their Sensuous Slathering Sauce for a more complete history. You can clearly smell the fruity heat of the habanero, which for heat seekers like myself, is a very inviting aroma. The habanero is well balanced against its competitors though, with an equal weighting of vinegar and hints of onion and molasses. 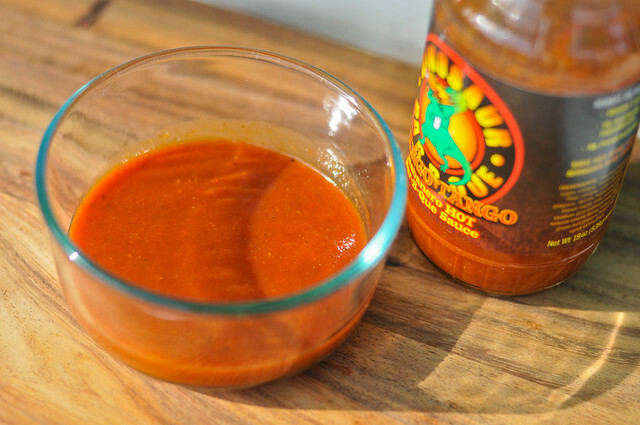 Wango Tango is more orange then the original, but retains the same attributes of a medium-thick sauce that clearly shows specks of spices chunks of vegetable and garlic. This sauce starts out a bit like a wing sauce, with a very hot vinegary kick. As the sauce settles on the tongue, some barbecue notes start to pop up their head, like molasses, onion, and black pepper. This is a fleeting taste though, as the habanero really starts to work its magic by imparting a strong, fruity heat that leaves a prolonged burn. Keeping up the great grilling qualities of the original, this sauce baked in well and caramelized nicely. It still packed a good amount of habanero heat, but just a tad bit a bit mellower than out of the jar. Here, the burn was more sustained on the lips than tongue, but was still strong enough to mask some of the really great flavors that are going on behind the heat. If you need a burning hot sauce, Wango Tango won't disappoint. Having an almost wing sauce quality of a vinegary heat, I think hot barbecue wings is where this sauce will really shine—the intense heat could ultimately drown the flavor of most meats, so to be sure you want to taste spicy more than anything else before using this. Retaining the excellent base of the original sauce, that great balance of ingredients and freshness gets a bit lost behind the heat here, but can still be tasted, even if it's fleeting.